1/10 onroad is on a resurgence, and with numbers rising in events such as ETS and the BRCA. 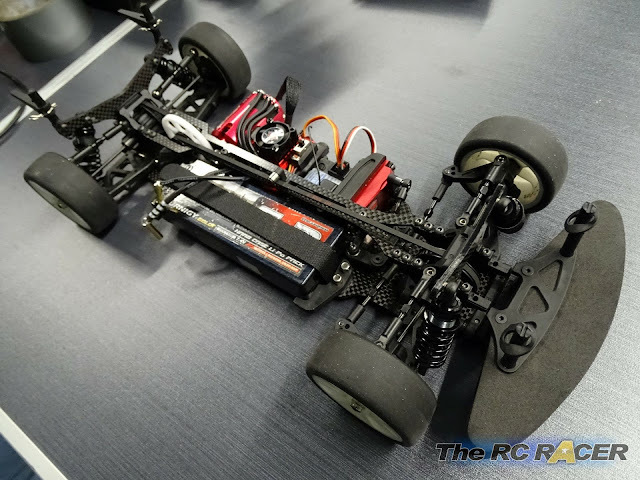 More people want to experience the thrill of driving an advanced 4WD race car and rubbing paint in an exciting and fun class of racing. Historically, one of the things that has acted as a barrier to some taking up the class is the cost of the high end kits. Recently there have been a few cars that have been released that aim to break down that barrier. The Hobbyking BSR BT-4 is one such chassis. 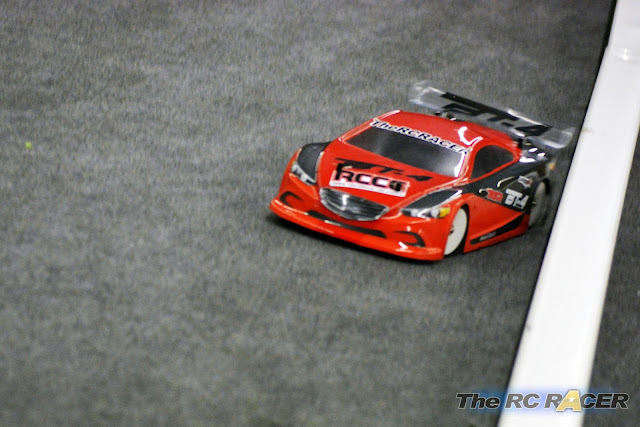 This kit is aimed at those who want to build a car that can be entered into a stock class, so the driver can learn the ropes and increase their skill and speed over time. 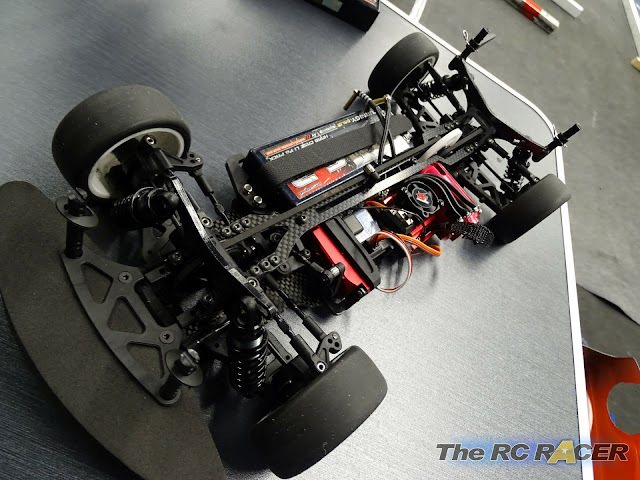 This is a genre of on-road car that can help this scene grow even more, so I was really interested to see what the BT-4 could deliver when Hobbyking sent me a car to take a closer look at. The kit comes with steel hex screws. 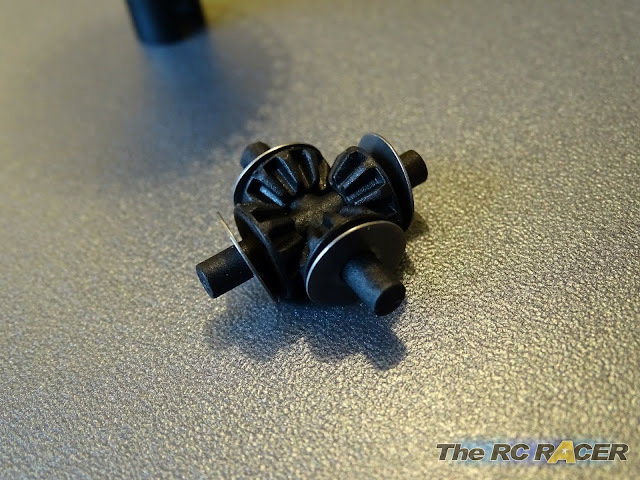 You will need 2mm and 1.5mm hex head drivers for the majority of the build, and a 4mm for the ball hex's that are only used on the lower shock fittings. Other useful tools would be a set of pliers, and a 5mm wheel wrench. The following covers the build, and some of the little tweaks I made along the way. 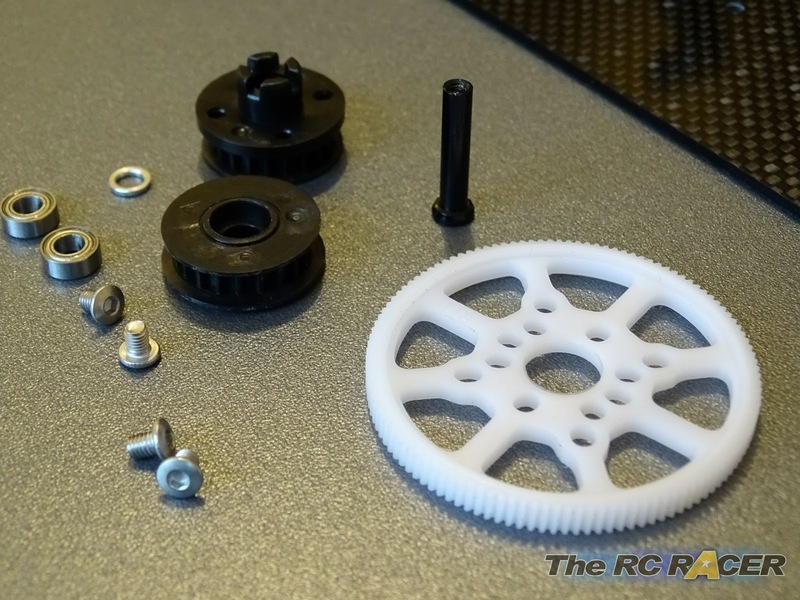 The first thing to assemble is the rear gear differential. These are standard in most 4WD circuit cars nowadays and it is good to see one included in this kit. 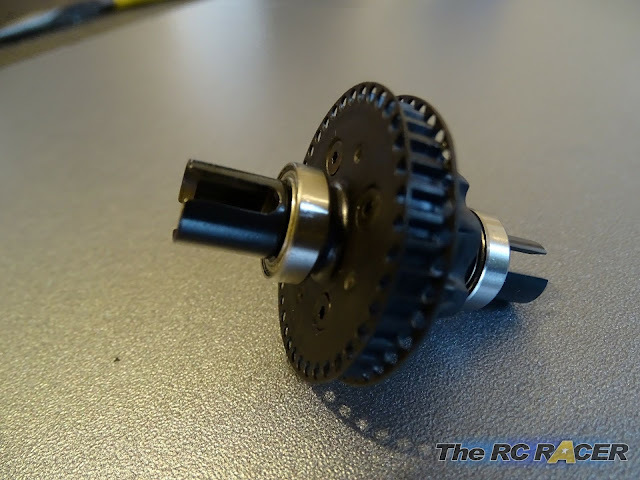 The gear differential is of a similar construction to many others out there with rubber o-rings and a gasket to help keep the oil in. TIP - Gently sand the rear of the bevel gears to ensure that they are smooth. Some of the parts have some small parts of their mould on them. 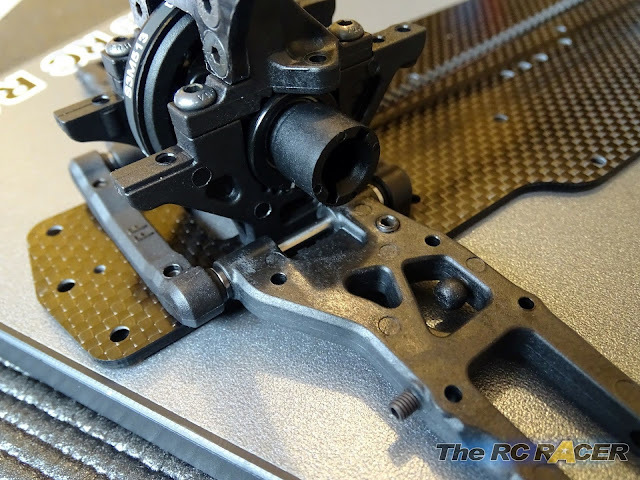 If you want a smooth gear diff, just a very gentle rub over a piece of fine sandpaper will just smooth them away. Tweezers are helpful to thread this pin through. 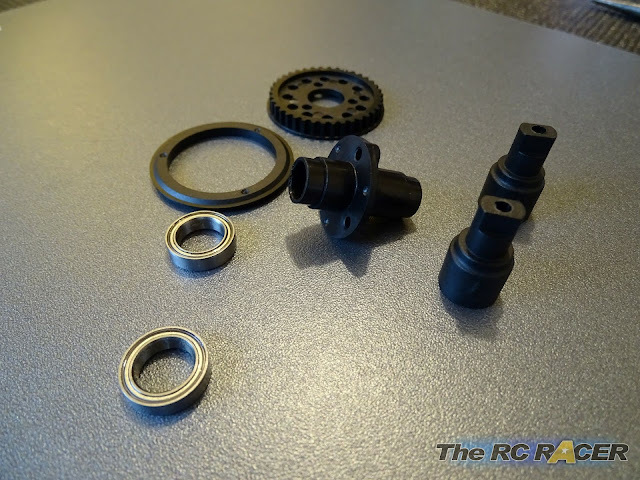 With everything ready you want to add a drop of the kit included shock oil to the o-ring and sit in inside the differential half. You can uses some AE-Green slime as well to help stop oil leaking out. You then need to fit the steel dif cup thought the o-ring (Use a drop of shock oil on this to help lube it). 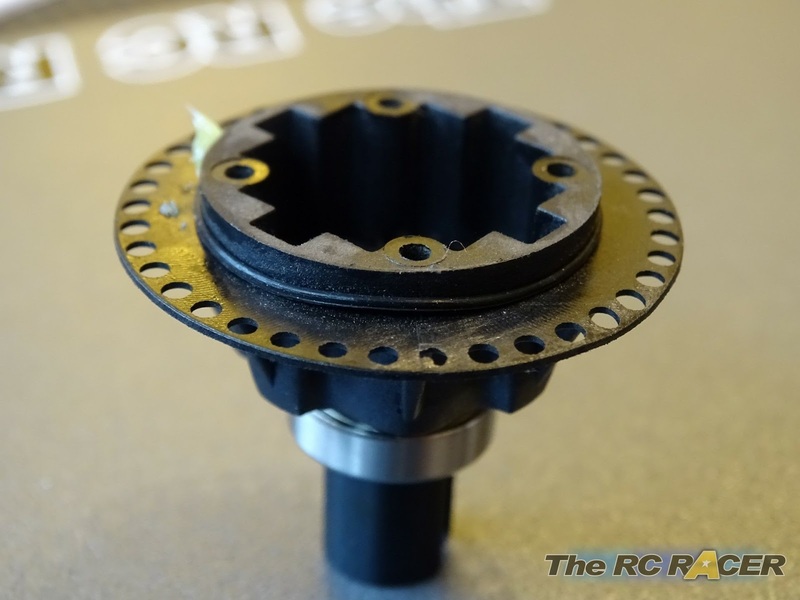 Once this is fitted through, you place a washer over it and fit a retainer pin though the end to hold the cup in. This should feel free and you can then place the 18T diff gear over the pin. 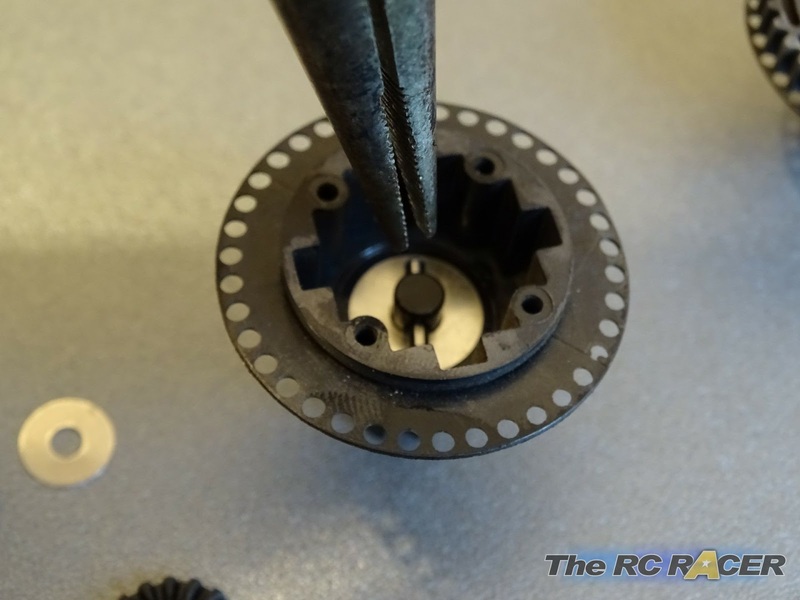 The other deeper differential side follows the same assembly order, however as this half is deeper you will need to use a pair of pliers or tweezers to easily fit the retaining pin in the differential cup. A blue gasket ready to keep the oil in. With the halves made, you fit the diff gasket. Just take your time and gently prod it into place, as you do not want to tear it as it will help the oil leak out. Again you can slap on some AE-Green slime on the gasket and around the screw holes to help keep the oil out. 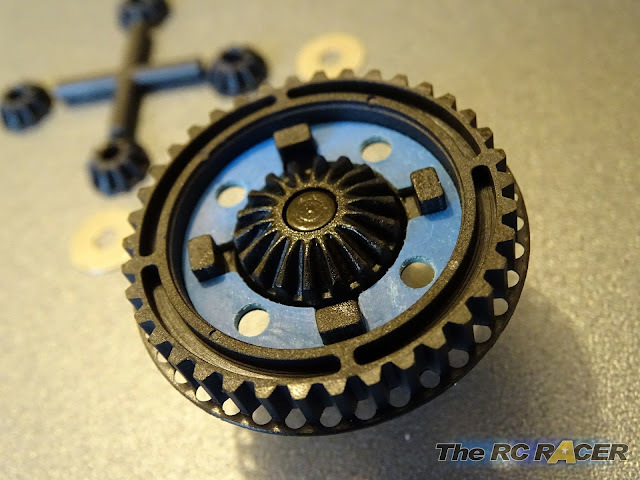 The 10T internal spider gears are next, they are mounted on a plastic cross with washers placed over them to ensure that they keep aligned and run smoothly when under load. Some people might be concerned about this, but I find that these are fine for on-road unless you are running really hot motors. This car is aimed at stock runners (21.5 - 13.5) and it should easily be strong enough for those motors. A rubber ring that you cant float in! The diff is nearly assembled now, you just have to fit the 24mm o-ring around the differential and then it's time to fill it with oil. The great thing about these sealed gear differentials is that they allow you to tune the differential action easily by just changing the oil. 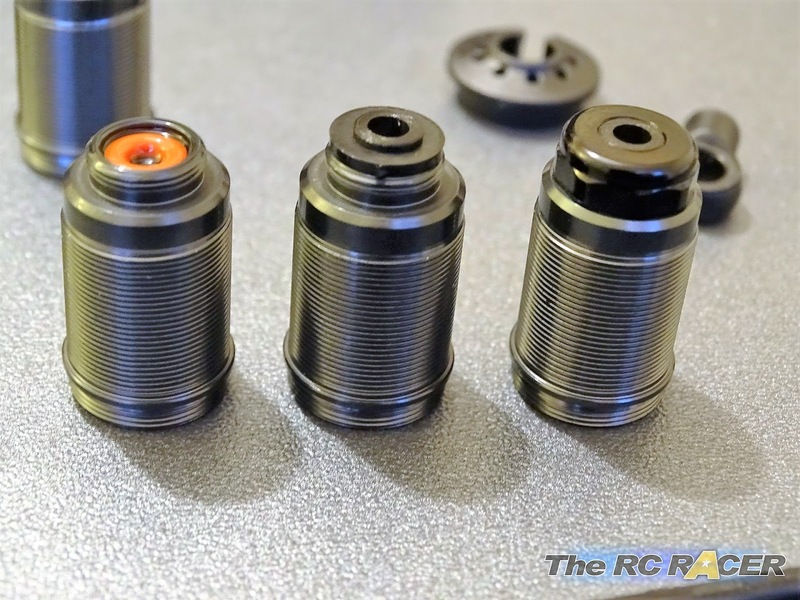 The kit comes with 5000cst oil which seems to be a popular setting at the moment. However it is quite thick for a technical course that I will be racing at, so I actually used 3000cst oil. With the oil settled it is time to screw the differential together with the four 2.5mm differential screws. You should always screw them all down, but not too tight, then tighten them in a cross pattern until they are screwed in firmly. This ensures that you do not warp the differential. Once built check you can move the diff cups, it should feel quite smooth with no binding. If its really tough, then just back out each the screws a 1/4 turn until it moves well. Take your time, the diff is really important to get right if you want a car that will handle consistently. 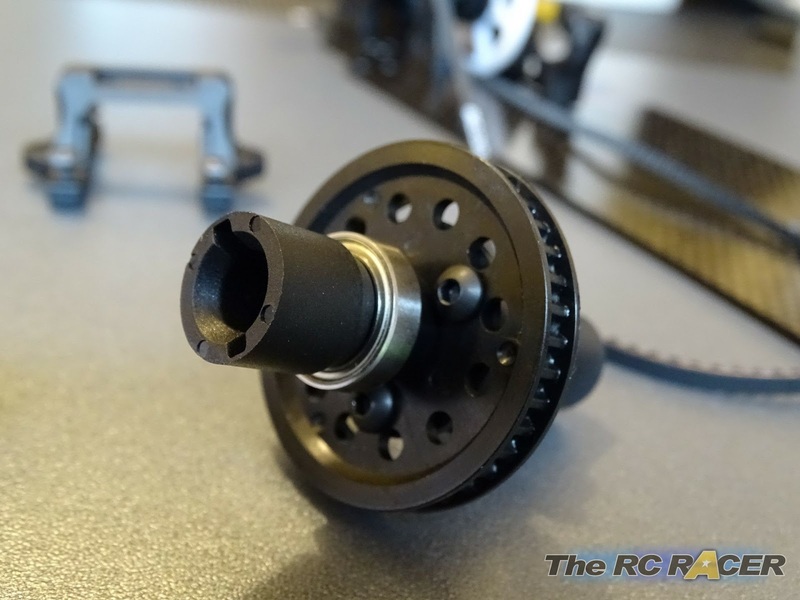 A front spool is de rigueur for 99% of racers and in keeping with the racing aspirations of this chassis you get one as standard for the BT-4. IMPORTANT - The instructions included actually has an error when building the spool, it basically shows you to fit the pulley on incorrectly and this will lead to drive-train issues. First up you need to clip the outer pulley ring onto the main 38T spool pulley. It clips on easily and it feels firm. I did use a couple of small drops of CA glue on the ring to ensure that would keep firm. 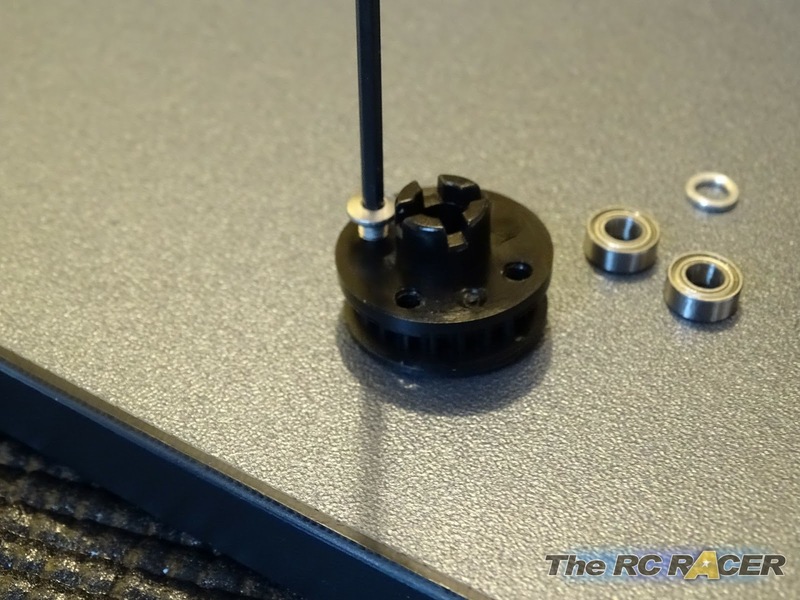 The spool pulley is then attached to the spool with 3 steel screws and the chunky plastic Spool cups are then attached with an internal screw at both sides. IMPORTANT - Ensure that you build the spool with the flat part of the pulley on the outer edge like in the picture above, not like the manual. I originally followed the manual and the top of the pulley could rub the shock tower, and it was also slighty un-aligned with the spur pulleys which could cause issues with them. The BT-4 has a carbon sandwich chassis. 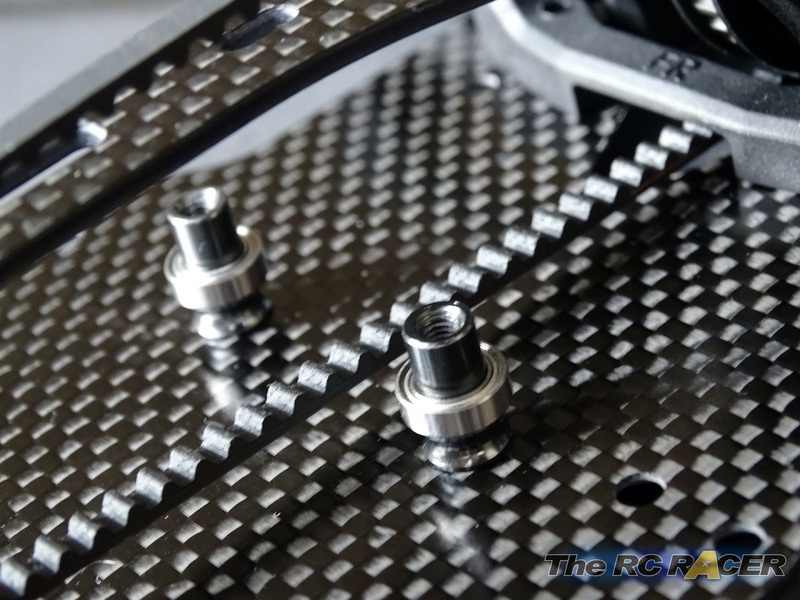 Basically it is not pure carbon fibre, but it has thin carbon weave on each side of the FRP plate, giving the appearance of carbon, and similar properties but at a much more reduced cost. 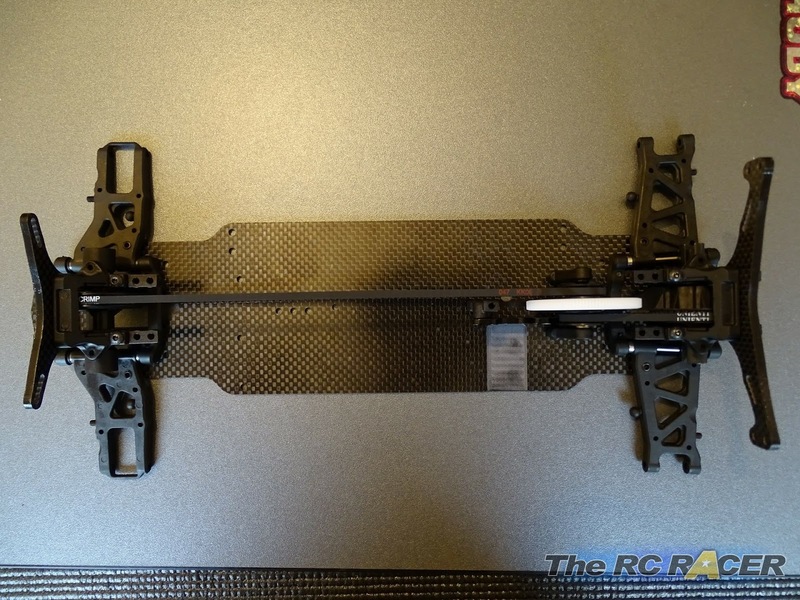 The chassis plates look the part and the lower deck is 2.25mm thick and as you would expect it has quite a lot of flex. It is also very narrow at 82mm, ensuring that the car is less likely to rub on the track when leaning deep into corners. Tip - Not everybody does this, but I treat the edge of my chassis with CA glue. It helps to stop de-lamination (where the material separates) if you have a very hard hit. I just pop a few drops on a cotton-bud and use that to gently brush the edges. I do it to the lower deck and the shock towers. With the chassis prepared, it's time to fit the bulkheads. This is a budget kit so you get plastic parts. The plastic does feel very stiff, and you can see in the picture above that there are plastic locating pins to help you keep the bulkheads aligned as you fit the screws in from underneath. Just take your time and do not over-tighten them at this stage. The motor-mount is next. 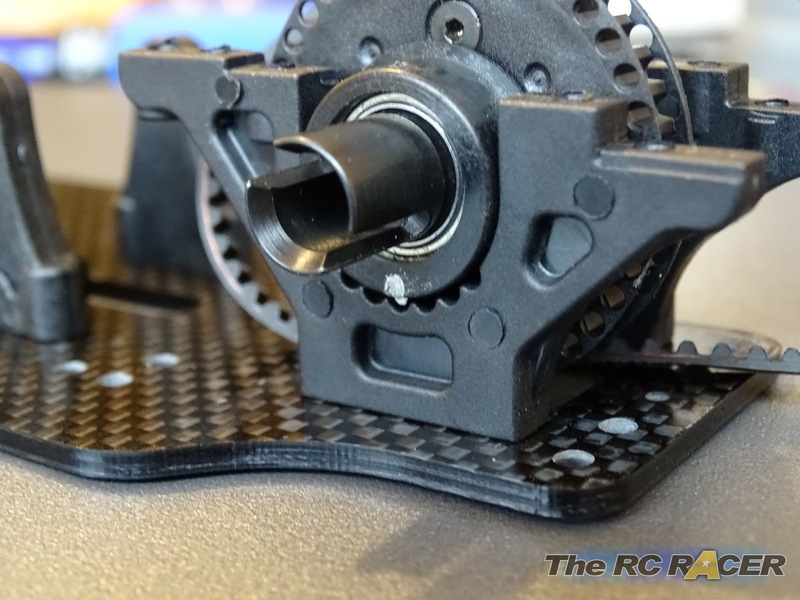 It is made up of an alloy motor plate that has a centre post attached, along with the one of the spur gear mounts. 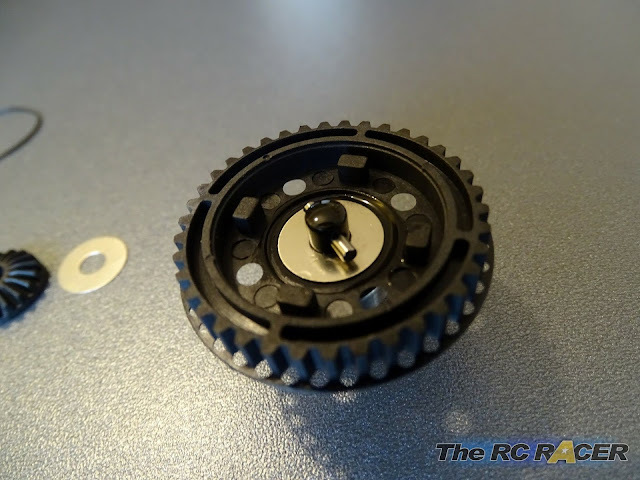 There are locator pins on the centre pulley holder. To fit the mount onto the chassis, I screwed the parts together but with a lot of movement. Tighten up the motor mount once the screws that mount it are attached. 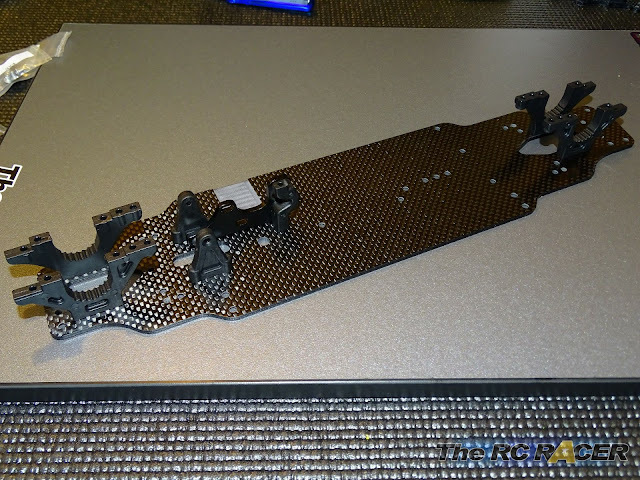 I then attached the screws from underneath the chassis, and tightened up the screws once attached. Then just time to attach the separate spur gear mount and we are starting to get something that looks like a car. 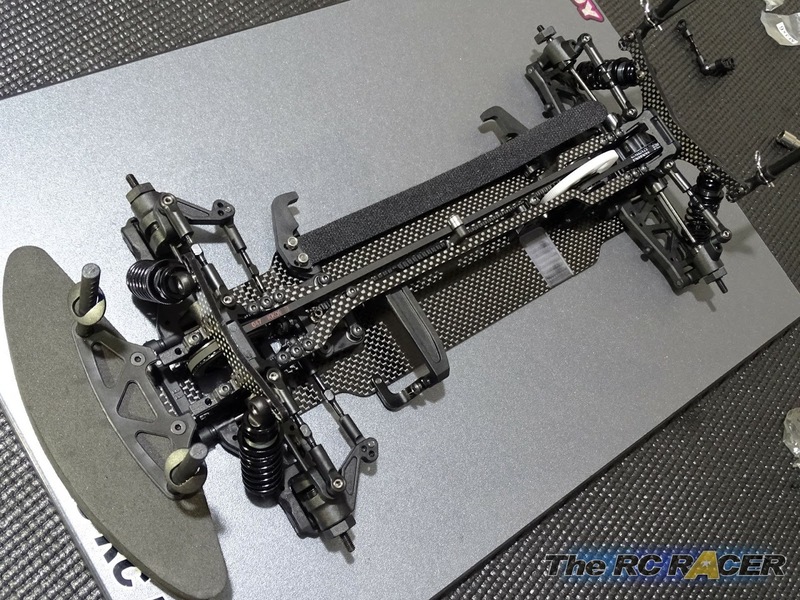 The BT-4 uses the touring cars standard layout of a dual belt design. 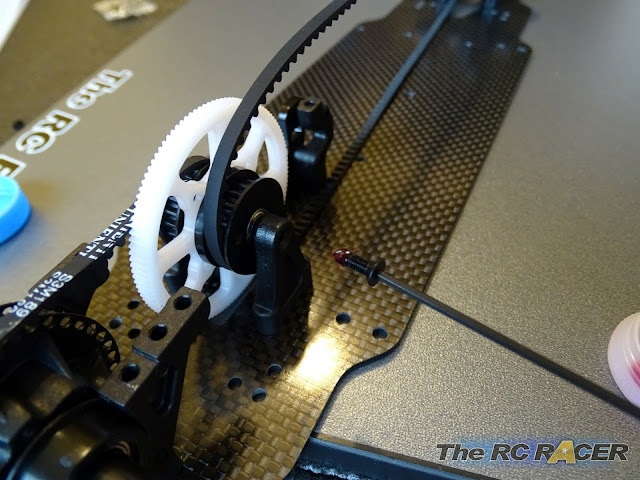 The Motor spins the spur, which in-turn rotates two 20t pulleys that rotate the belts that reach to the 38t pulleys driving the spool at the front and the differential at the rear. This gives an internal ration of 1.9. 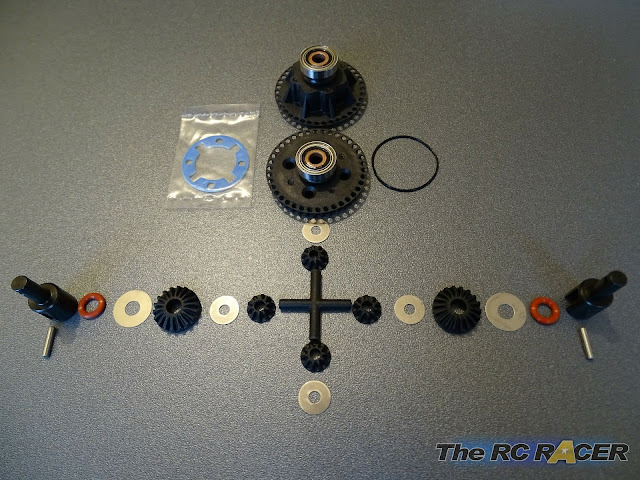 The car comes with a 64dp spur gear. This is a nice touch and again it shows that BSR is aiming this kit for stock class runners who need to fine tune their gear ratios. TIP - Thread the pulley screw holes before assembling. I used one of the spur mount screws and just screwed it in a couple of millimetres so that it would be easier to assemble, as otherwise it is a pain to do. Once threaded and the screw removed, you just need to attach the spur to the pulleys with the four special flat headed screws. Take your time, and again tighten up the screws at the end in a cross pattern to ensure that the spur gear does not warp. It may take a few attempts to get this spot on, but the straighter this is, the more reliable it will be. 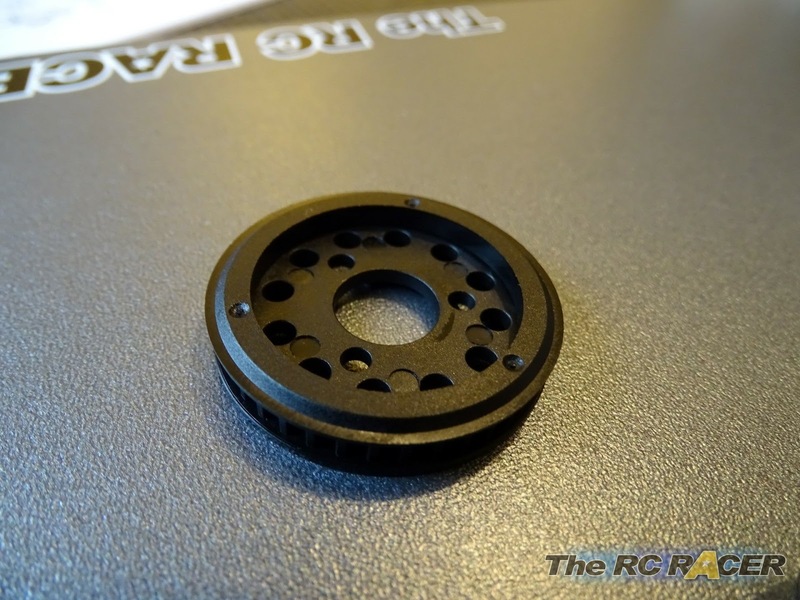 With this done you can fit the 840 bearings into the pulleys and check that the steel spur lay-shaft fits well. It should spin freely. You now need to hook up the short rear, and long front belts over the pulleys and fit the shaft and a 1mm thick washer. 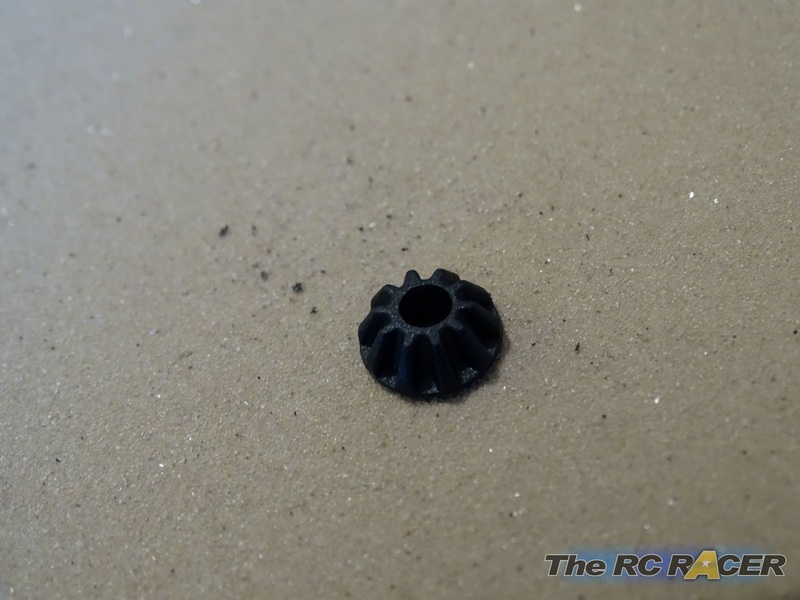 I actually use 0.8mm of shims (6mm) instead of the attached washer. When I initially fitted it, it felt too stiff when I span the installed spur gear. Again any drag on your drive-train puts you at a disadvantage, so I shimmed the car until it span freely but had only a tiny amount of lateral movement. 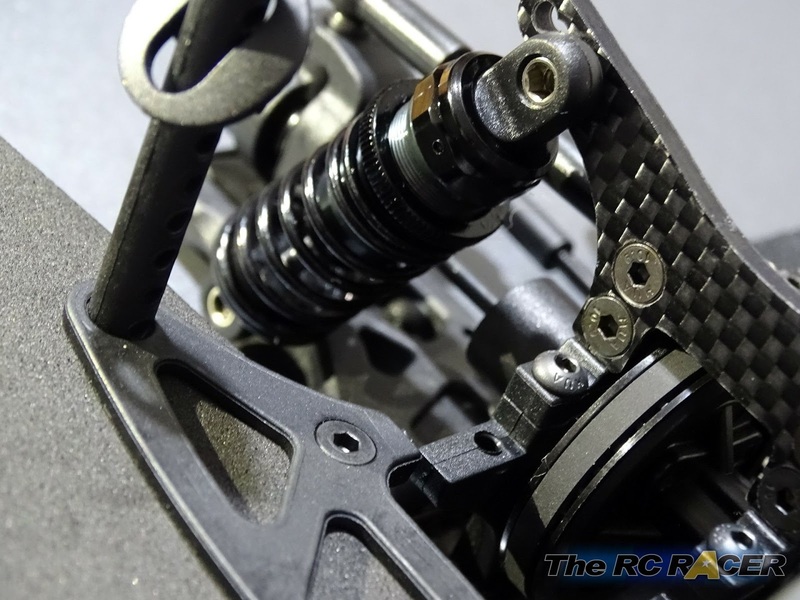 The car really requires you to use thin spurs such as Kawada Super Ex or Panaracer. When fitting the spur gear and pulleys I used a little bit of threadlock gel on the two screws that hold the shaft. This gives me peace of mind that it will stay attached. With the spur attached its time to fit the spool and differential into the bulkheads. 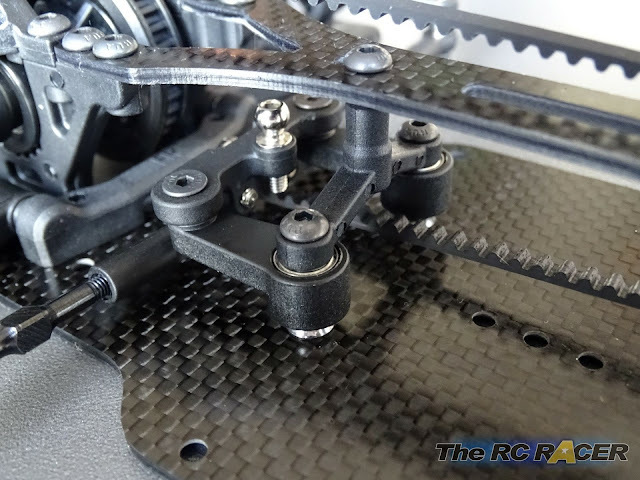 As you can see there are settings on the bulkheads that allow you to change the belt tension and to raise and lower the actual diffs. This is achieved by two nylon cups that you fit onto the diffs and then use to lock them into place on the bulkhead. I always put a drop of white paint in the marker to make it more noticeable, as it can be hard to see when adjusting these trackside, with the car fully built. To get the belts on easily I fit them on the top half and then rotate the diffs so the belt just follows it around. Once the belts are on, you need to fit the upper bulkheads. These are also plastic as you would expect, but they fit well. 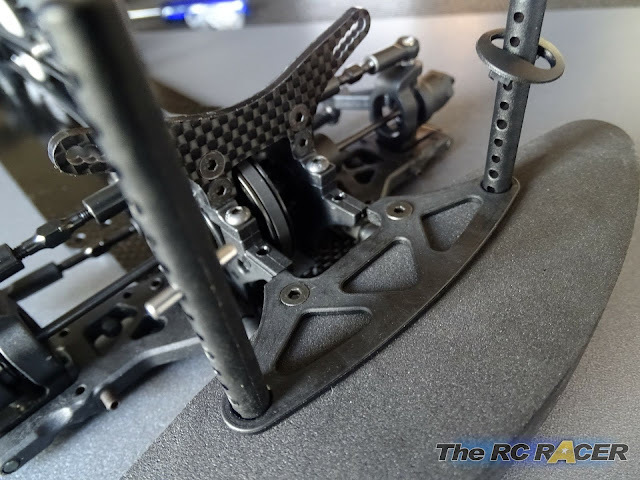 You need to fit both the front and the rear upper bulkheads and you will be able to spin the spur gear with your thumb and get a feel to see if your drivetrain is smooth. 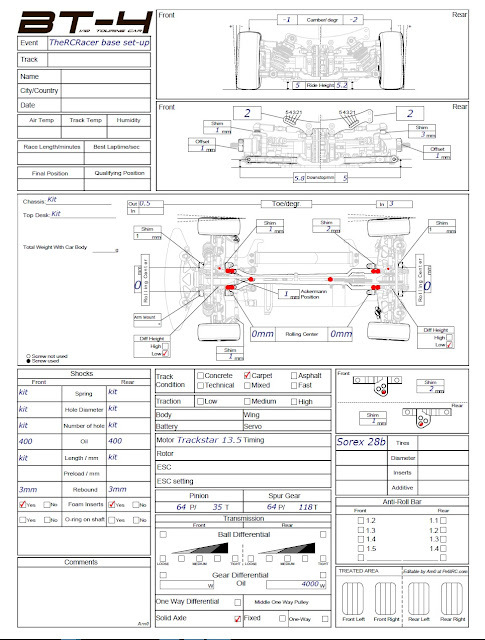 The car has low profile front and rear towers. Unconventionally the towers are different thickness's, the rear is 3mm thick and the front is thinner at 2.5mm. 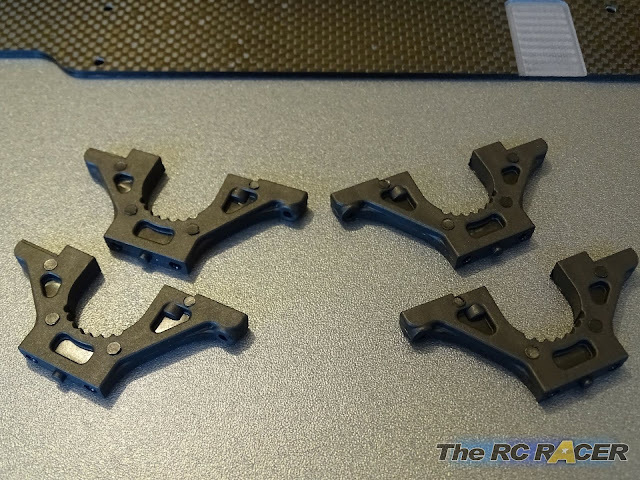 They fit on the bulkheads with 4 screws and they also provide more strength to the overall bulkhead. Chunky and stiff.. That's how most like em! Once both are fitted we move onto the suspension arms. These feel very stiff and they are nice and chunky. They have a 4mm grub screw mounted in each arm, giving you droop adjustment. Plastic mounts, these will take a lot of the force if you catch a wheel. 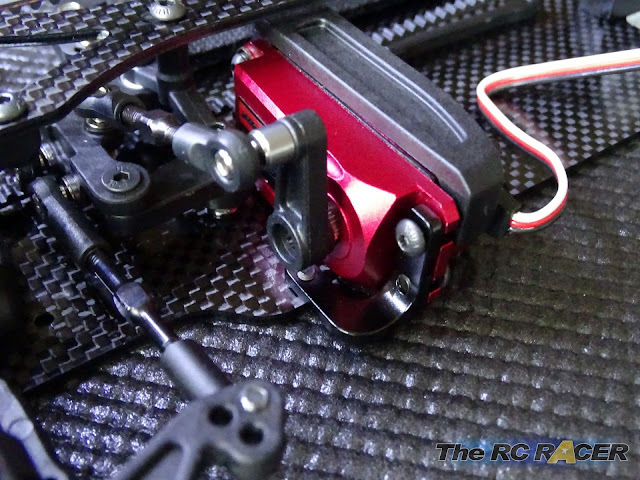 When it comes to fitting these arms, they are mounted on suspension pins which fit into some arm mounts. These arm mounts are all marked appropriately and once attached you will get 3mm of rear toe-in, giving you a stable ride. When attaching these, you will need to slide the pins through the arms (DO NOT REAM THEM OUT) they may feel stiff as you slide them in, but that is ok as they rotate in the blocks. If you ream the arms you can create extra slop. You use shims to space out the arms. These can allow you to change the overall wheelbase, and also to help move the weight of the car over the axles. Once attached you want to check that the arms move freely, mine were good but if yours do bind then use some smaller shims to free them up. The steering is next. 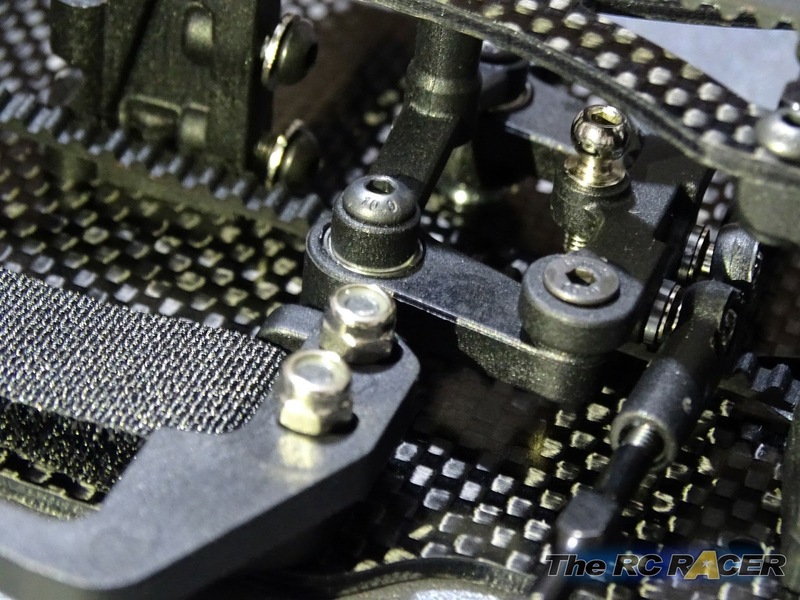 You can change the ackermann by placing shims behind the ball studs that are mounted on the steering bridge. 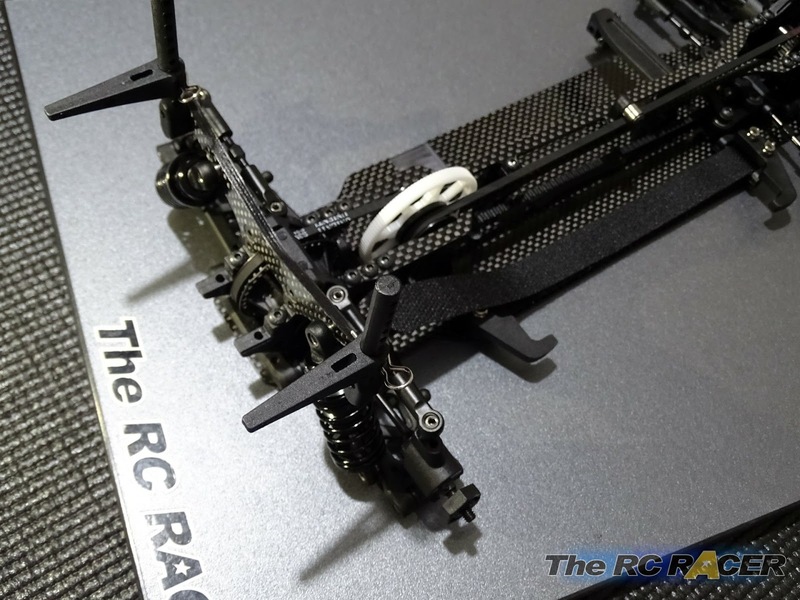 The dual bell-crank steering is fully ball raced and will be very smooth. TIP - To remove any unnecessary slop I tightened the screws down, and then just slowly unscrewed them until the arms moved freely. The steering assembly sits on some steering posts, they are attached from under the chassis and you fit the steering arms on top of these. Once fitted you then attach an upper section to the steering assembly. 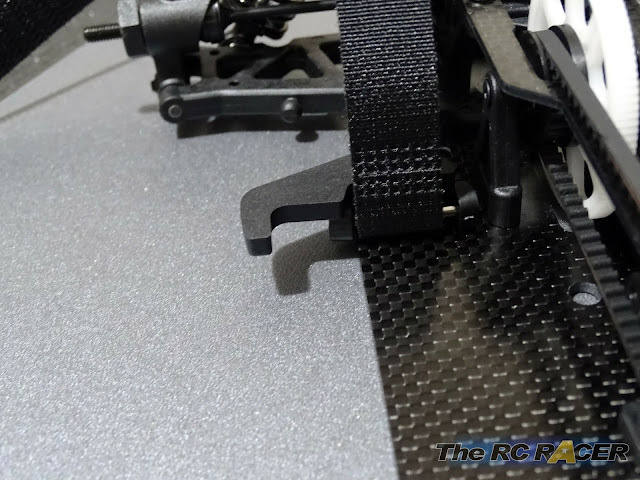 This affects the flex at this part of the chassis, keeping steering response consistent. At this stage you also fit the upper deck. To fit the upper deck I attached all of the screws but not firmly in, then pressed down on the lower deck so the chassis was perfectly flat on my set-up board. 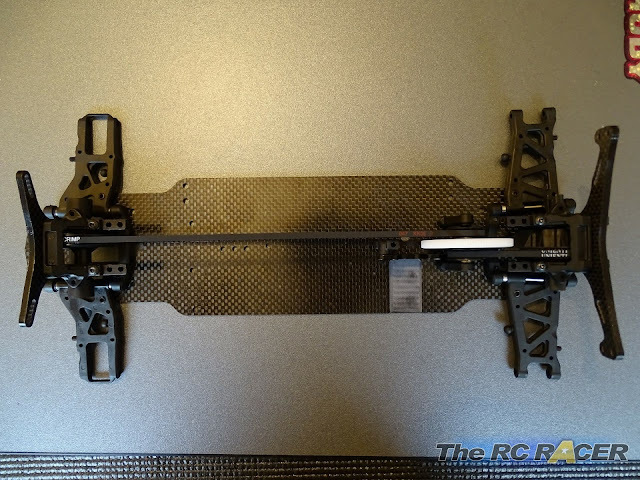 To ensure that the chassis was as flat as possible, I tightened the upper deck screws from end to end in a cross pattern (Apart from the screw that fits into the steering post via the deck, you want that to be at least a quarter turn unscrewed as it should allow the deck to flex a little at that point). With the chassis nearly built it's time to check out the drive-shafts. 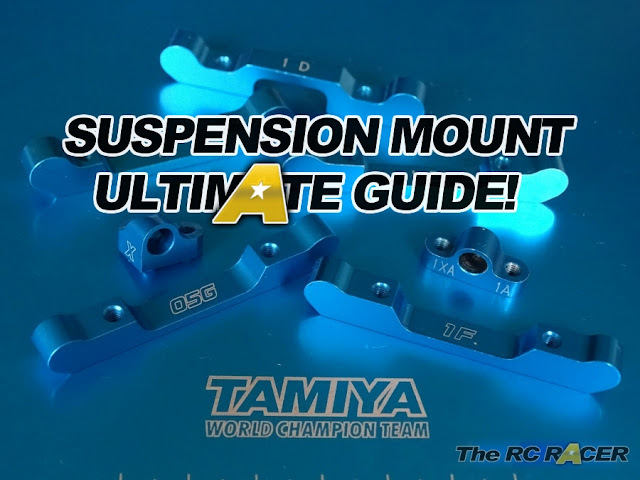 The kit comes with full universals, these will give you better efficiency when the suspension compresses, and as the car steers. 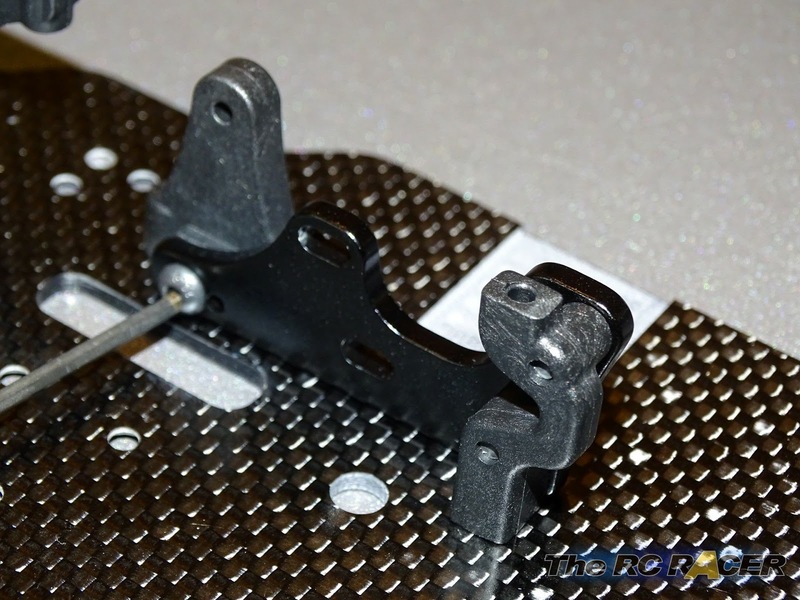 They are already assembled, and they also have a clip that holds the drive pin in place. I like this design as there is no grub screw that can fall out. I disassembled them and just placed a little bit of AW grease the internal pin as it helps them to last longer. 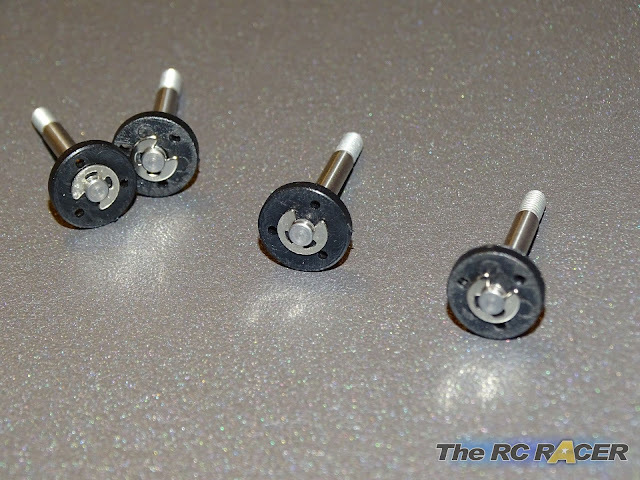 The 44mm front drive-shafts are mounted in the front hubs. 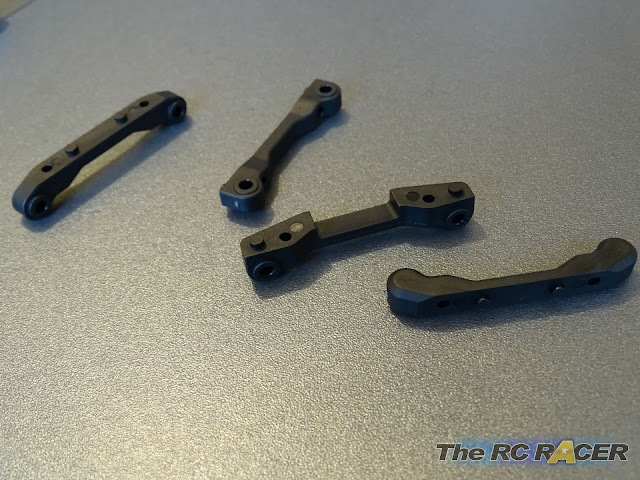 As they are made from the same stiff plastic as the suspension arms, as you can see there are 3 setting holes that you can use to adjust the ackermann. The hubs take two 1050 bearings each and you then need to fit the 4mm plastic hex. Tip - At this stage I place a 0.1mm 5mm shim on the outer bearing behind the pin. I then place more 5mm shims on the inner bearings until I have removed the lateral movement. It's not essential, but I do this will all of my cars, it keeps the wheelbase consistent on the corners. I also do this at the rear. The front hubs are mounted into C-Hubs. These have 4 degrees of caster, which is standard for most modern touring cars. They feel very chunky and strong. 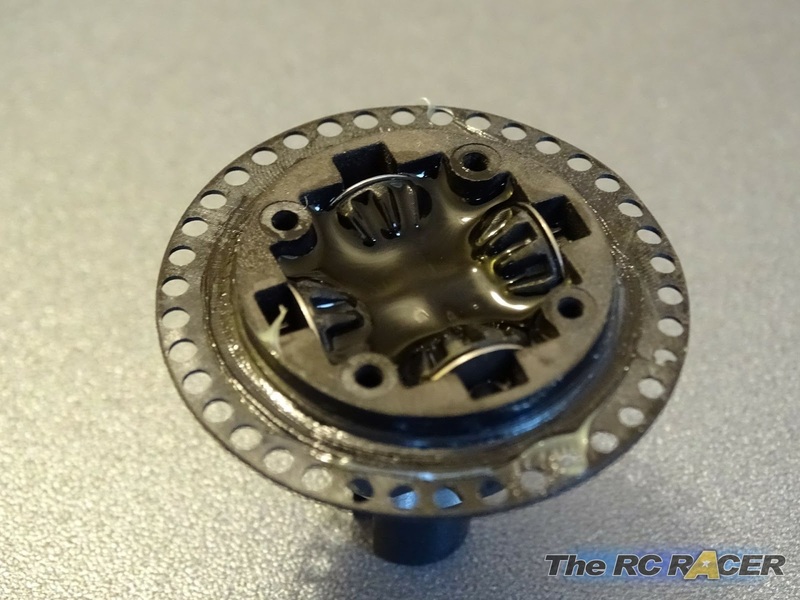 Hub is mounted into it with two flange tubes and there is very little slop impressive. 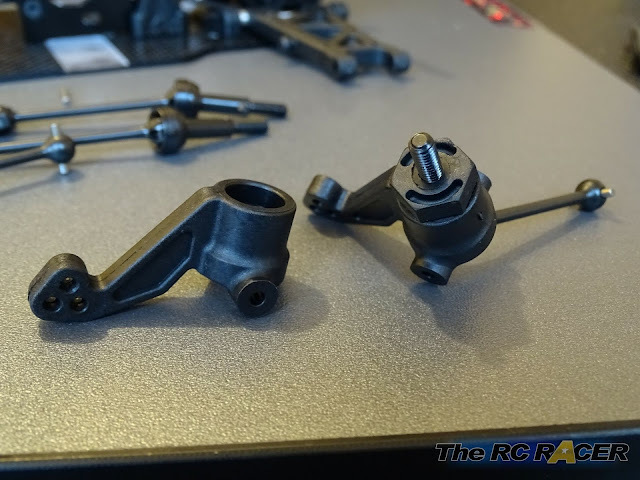 The C-hubs are then mounted to the front suspension arms with a suspension pin that is held in with a small grub screw. There is no reaming needed and the arms dropped under their own weight. The upper kingpin is attached to the upper bulkhead with steel turn-buckles. Switching to the rear of the car we fit the 43mm drive shafts, these again spin on 1050 bearings. Like the front, the hub is mounted in the rear arm with a trapped suspension pin. To me one of the really impressive features that the BT-4 boasts about is the inclusion of threaded low profile aluminium shocks. 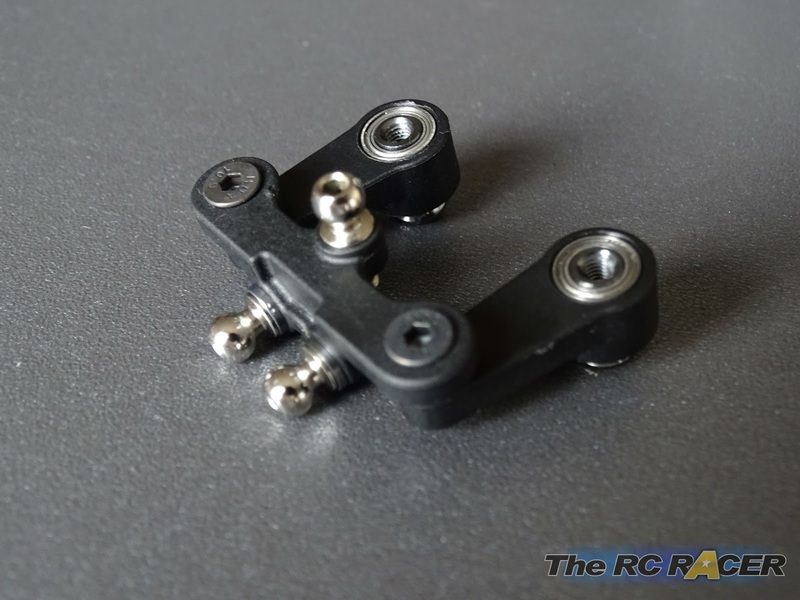 (They are 56mm tall) This should give you a reliable and exact way to change the ride height off the car. The autopsy of a shock! 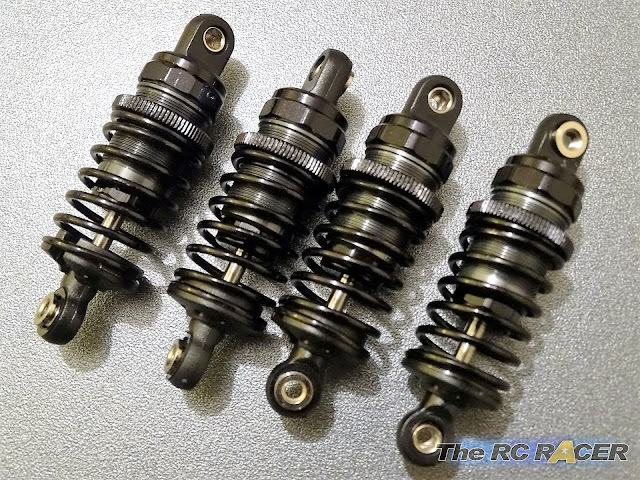 The included shocks will be familiar to anyone that has built a high end touring car. The components look good, although the shock pistons need a any excess trimming away (The excess can rub the inner cylinder, binding the movement). 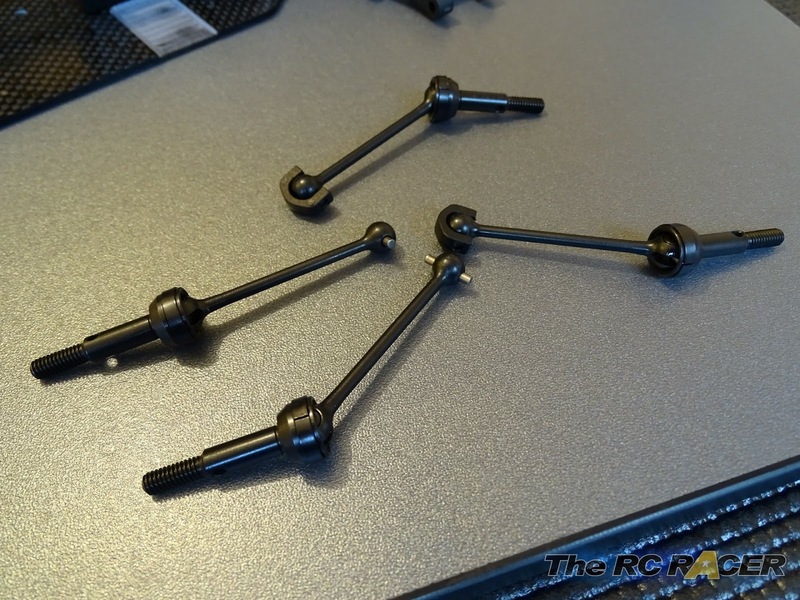 I was tempted to fit some nice top-end O-Rings as these help the smoothness of the shocks.. I resisted as I want to keep it Stock for the review. Next up it's time to assemble the main shock cylinder. 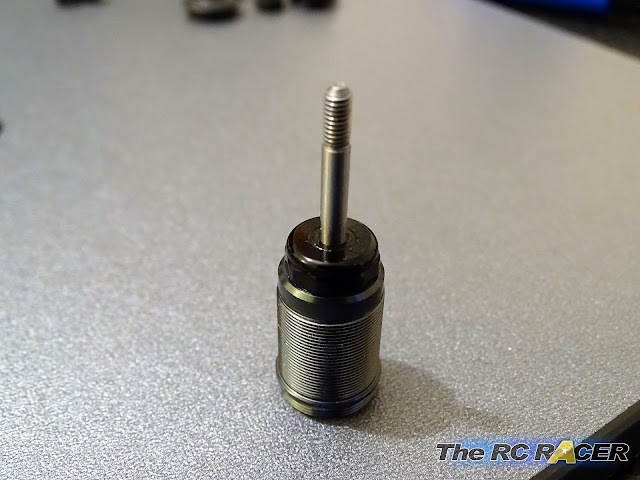 Place a drop of the included shock oil on the o-ring, place on the shaft bushing and screw on the lower cylinder cover. To fit the shaft into the shock cylinder, drop some shock oil onto the shaft and gently thread it through the o-ring. The oil helps reduce any resistance, and lowers the chance of creating a snag in the o-ring, causing leaks and getting air into the shock. The final shocks look great! The kit includes 300wt oil, this is a little soft for me as I run on carpet, so I went for 400wt. Once I let the oil settle and and the bubbles disperse I attached the cap that contains the diaphragm. As you can see the shock caps have a small hole in the cap, this allows you to set the rebound easily as you just unscrew the cap a couple of turns, move the shaft up until you have the desired amount of rebound (I went for 3mm) and then screw the cap down again as the excess oil spills out. The springs are all the same for front and rear and they feel ok, kinda soft (Yok Blue) but they should be fine to get started. When attaching the caps one did not seem to fit well. I took a look inside the cap and there was a little bit of anodising that had built up, I used a small screwdriver to chip it off and then it attached perfectly. 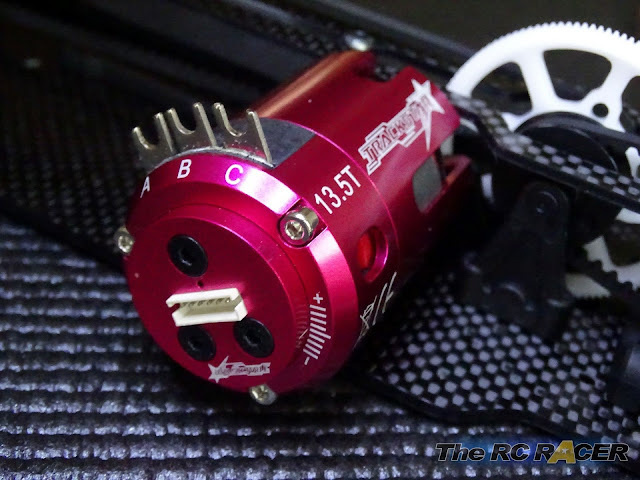 The final shocks look great and they have a smooth movement when you move the shaft. It it not world class, but good, and it can improved by upgrading o-rings etc. 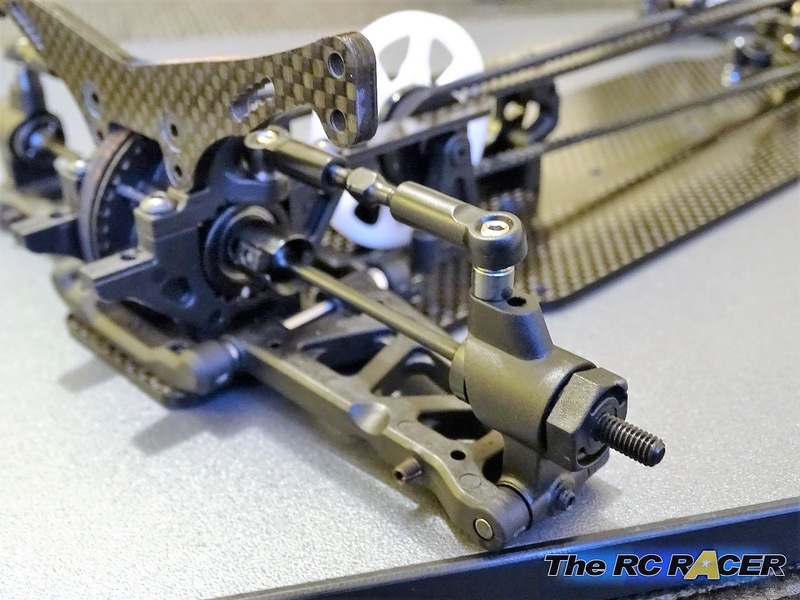 When fitting the shocks, there is only one setting on the lower suspension arm. 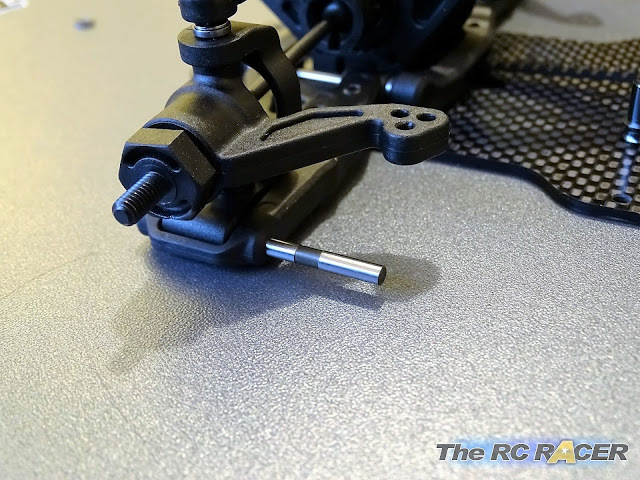 The upper shock position is the only one that you will change and that is attached with a screw that is easy to remove and change the setting. The car is now nearing completion, and it's time to fit the front bumper and body posts. This is one thick bumper and I wish all TC's had ones this chunky. It is held in securely and it will give you a bit of reassurance when you occasionally hit a board. 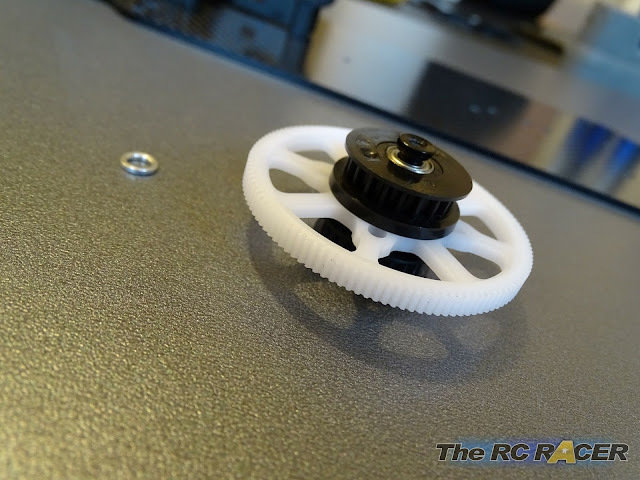 Next up is the servo mount, despite the initial appearance it is not a floating servo mount, it had a metal support arm to hold it in place. There is however an alloy replacement that will be available and that will not use the support arm, giving you a proper floating mount. Velcro battery straps save you wasting tape. The final areas to assemble are the battery compartment. There is a plastic inner brace that stops the battery hitting the belt, and a large chunky velco strip mounted into some equally large plastic battery stops. You have to really crank down the m3 nuts onto their screws as otherwise these will shift and you will have a funky handling car (Trust me I found this out, check out the test drive). The velcro solution is great, and much better than a solid bar, however for those who just want to use tape there are no holes in the chassis, but apart from the extra little bit of weight this solution is just as good. 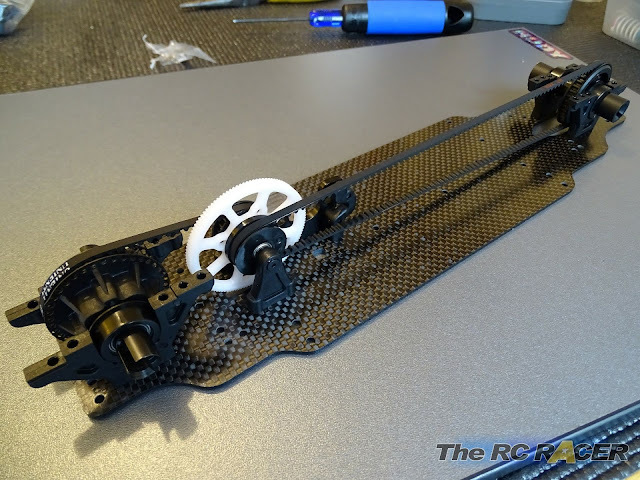 The fully assembled chassis without electrics weighs in at a skinny 530g. 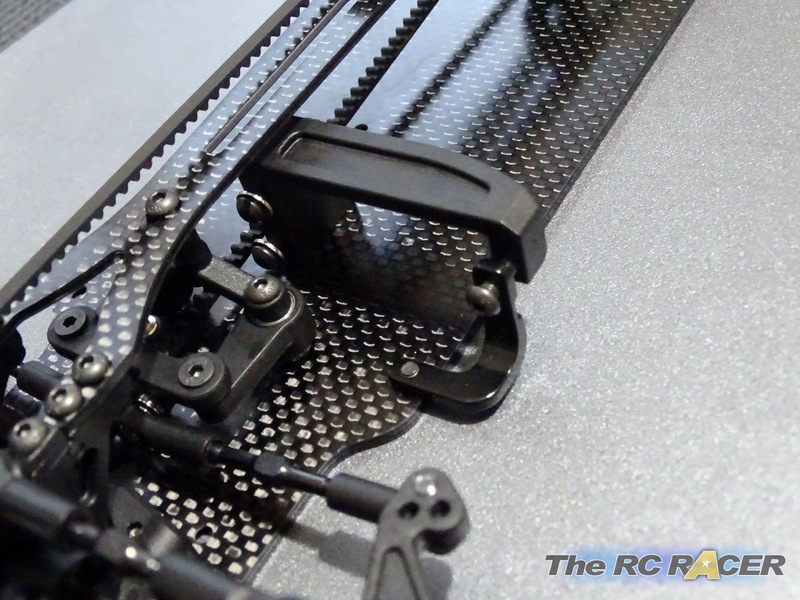 This is very light but you would expect it to be lighter than a high end kit due to the materials used. 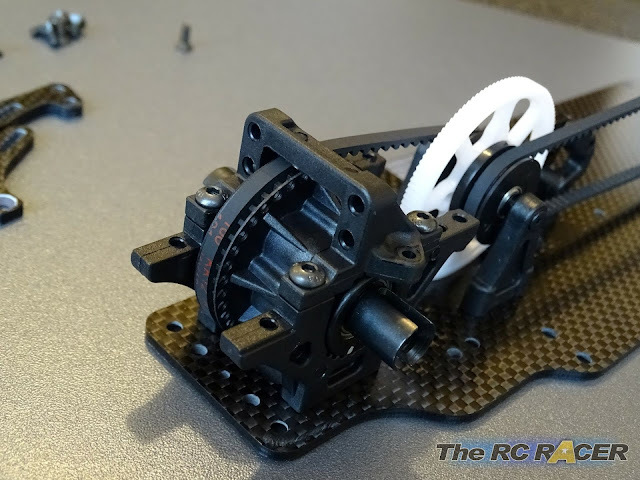 The motor mount and spur assembly designed to give a good amount of flex. let's get this car on the track! With the chassis all complete and the drivetrain feeling smooth, it was time to fit the electrics. 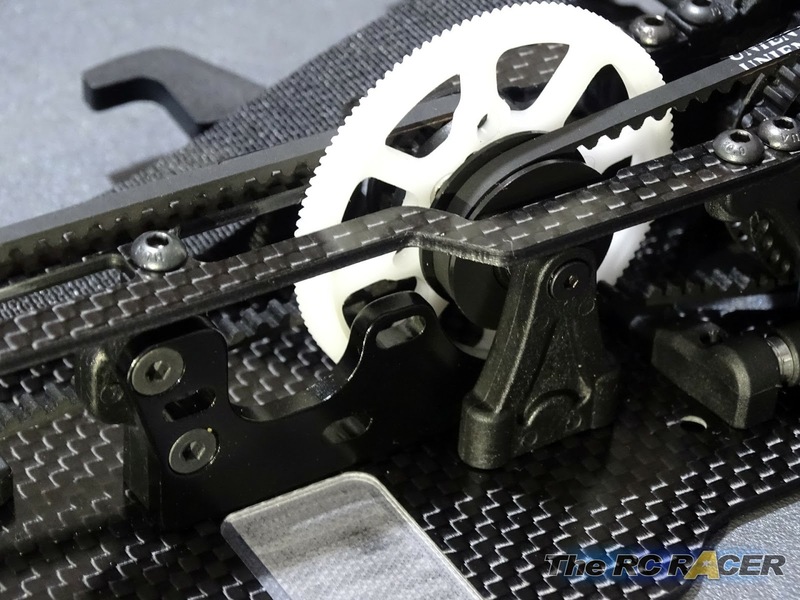 I used a low profile Trackstar TS-915 servo. As you can see it has a full alloy case and a great specification for touring car racing. It is ball raced, with 8.8kg of torque and a speed of 0.1 sec thanks to it's internal brushless motor and light titanium gear set. The Trackstar motor was mounted next. 13.5 Blinky has started to become a popular class in my area. 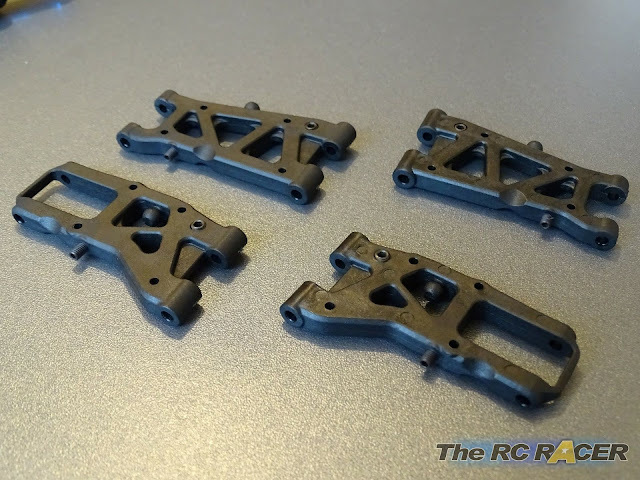 It makes a change from the 17.5 that I normally run, and importantly it will help push this entry level chassis, which is aimed at popular 21.5 and 17.5 blinky classes. A red and grey paint job to match the chassis inside. In the box you also get a clear shell to paint. The lexan feels thicker than normal and it is quite heavy. I sprayed on some paint and took the car to the track! The first shakedown was at the newly established Warrington Raceway. The circuit itself is great, very large and the clientèle are all friendly and enthusiastic. Before I started the race I had an issue, I went to fit on some used Sorex out of my pit bag but the front wheels would rub against the hubs. This was not a big issue to me as I had axle spacers on hand that I slipped on and the wheels were fine. The Kit does actually have tyres and wheels included and they fit fine, other makes might also fit but the Sorex definately needed the 1mm spacers. The first race was very much a shakedown, I started the race and the car was good from the off. I drove around the track just getting a feel for the car. It was all going well for a couple of laps, but then the car stopped steering as sharply to the right, however it was only very intermittent. Despite this the car was still running quite well for its first few laps. I had started last in a field of 10 runners and despite them running boost I was able to soon catch up with the back markers and pass them. I had worked my way up to 5th and then THWACK! Someone had crashed at the end of the straight and reversed straight into my car as I was at full tilt. Those are tears on the pit table.. but you should have seen the other guy! I could hardly look as the cars went flying, but everyone let out the collective 'Ohhhh!' at that moment. The BT-4 landed and I wiggled the stick but it was dead. (Sigh) I left the podium and walked down to check out the damage. 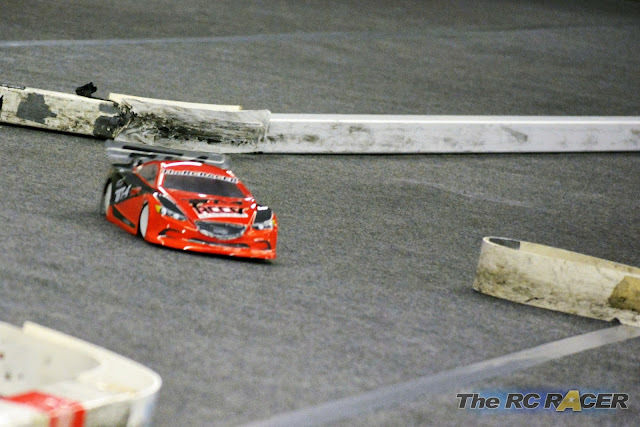 The force of the crash had cracked the bodyshell, and made the lipo move so much that it had unplugged. The amazing thing was that nothing else had broken. I was really impressed with this, it might have been the large bumper, or just lady luck but the car itself was fine (The other one suffered a broken hub and drive shaft). When checking over the car I noticed that the battery mounting system was not tightened down enough, so it has started to move and the steering arms would occasionally hit it, and push it back (Thanks to the strong servo). This was causing the slight steering issue, so I took out my trusty wrench and screwed the nuts down much more firmly and waited for the next round. With the shell hastily tapped up with some gaffer tape, and the battery holder now really stiff I set about the second race. This time things were going much better, I again started at the back but the car was feeling good, but there was a bit of under-steer on some of the tighter sections. I managed to pull the car up to 6th thanks to others mistakes but I knew there was a lot more to come from it. I revised my set-up for the next race, mainly changing the front camber and also adding a little bit of rake to the ride height. As I started the third race I could instantly tell the change. The car was feeling very positive, especially when turning into the corner, maybe a little too much but this allowed me to get much more speed on the in-field. With this added turn of overall lap speed I was hounding the 5th place driver, the long straight would see them squirt away as the boost kicked in, but following the long sweeper there was a tight 180 that would start to see them go wide. I studied their line and after 3 laps following I decided to make my pass by coming in at a more agresive line to the apex to get my nose in. 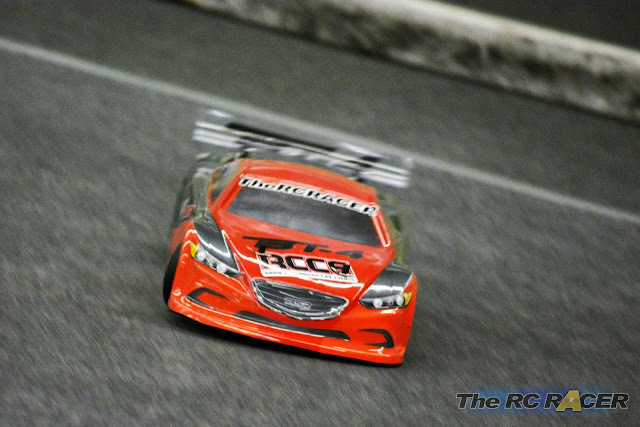 The car stuck well and despite a little bit of the rear end kicking out I was able to hold the position and once ahead I used the rest of the in-field to capitalise on the speed advantage I had on the corners and gain a large enough gap to hold them off at the straight. Next up was the fourth place man, again I had to rely on them to make mistakes as ultimately I didn't have boost and as luck would have it they went very wide on another part of the infield and lost time, I positioned myself on the right line and they had to concede their place as I took the corner. I was happy to be in 4th, the car was quite aggressive with the extra camber I added so It was quite demanding to drive at times, but I was still catching on third, which on the following lap was actually second as a car dropped out. I kept on their tail and despite loosing on the straight, the driver clipped the inside of the sweeper and rolled out allowing me to take the second position. The top guy was a lap ahead of me so I just had to keep ahead of the pack for the remaining time and I managed a second place. I was pretty happy about that. Unfortunately I had to leave before the other races, but I was happy with where I had reached on it's first outing. Since then I have refined the set-up and I have got the car running even better. I have done 4 race meetings now, and the car had been good with nothing breaking. The only issue I have had since is that I stripped the spur gear. This was because after another large collision with a board.. (My fault this time) a couple of the chassis screws that hold the motor mount loosened and this little bit of flex took the edge of the 64dp spur. I tightened these up and replaced it with a new Panaracer spur and it is good as new. Here are the current settings that I have. The car feels very easy to drive with this set-up. This car is not aimed at toppling the premier brands off their perch, but instead is pitting itself against the new wave of cheap entry level club cars. Here the BSR BT-4 takes a lot of modern touring car design cues, combines them with strong but cheaper material alternatives and shows a lot of promise. It's not perfect, the main spur pulleys have a bit of movement, (although they have not let me down), Plastic hex's can lead to you over-tightening the wheels, and it would be good to have ensured that it had included a basic allen key set for the various hex hardware along with a wheel wrench as this is kit is aimed at beginners. Spares availability is also something that will need to be considered. Every car breaks so you will need to get spares so hopefully Hobbyking can ensure that all of their main regional warehouses have a good stock of replacement parts if this car is to become really popular. Also it would be good to have a selection of Hop-ups. 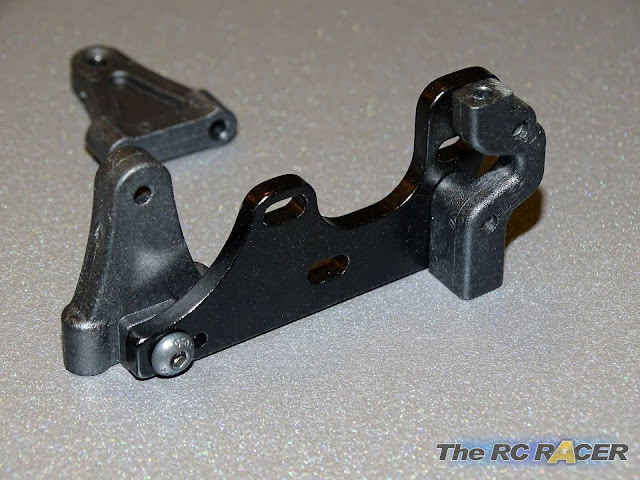 I would love to see a roll bar set, and some alloy parts such as the spur pulleys, floating servo mount etc. 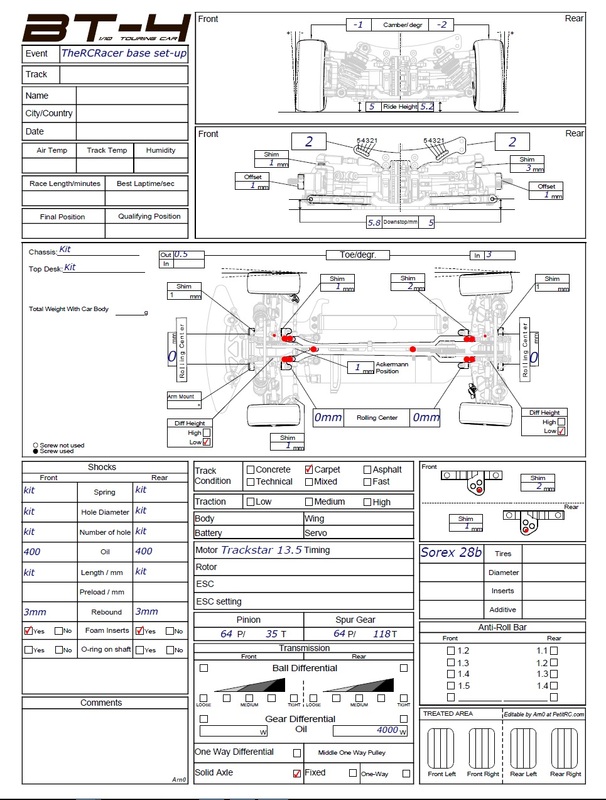 I was impressed with the specifications for a car that is aimed to be cheap (Price is not yet confirmed), alloy threaded shocks, fully ball raced, gear diff and steel hex screws etc. Yes lots of the car is made from plastic, but I have now driven it hard on several occasions and none of these parts have broken. The drive-train has also remained smooth and has held out well with what I have thrown at it. So there you have it. 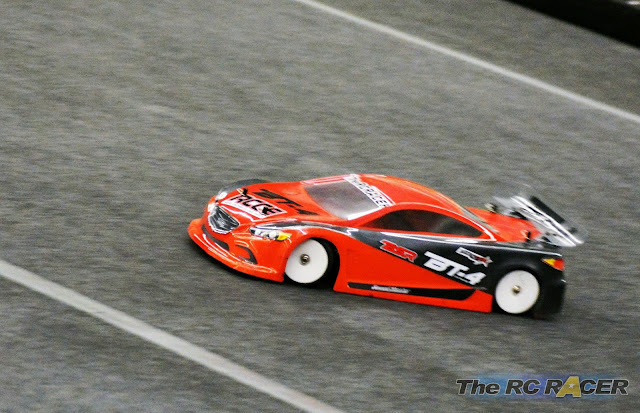 The Hobbyking BSR BT-4 is definitely a contender for the budget club racers crown. 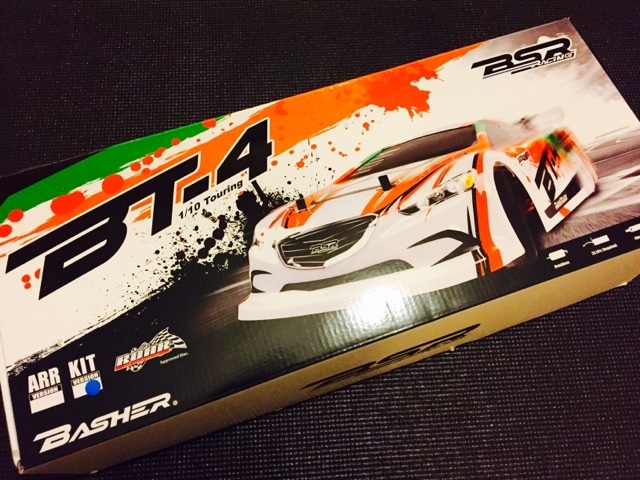 It provides a cheap way into exploring the exciting 1/10 onroad racing scene, be it VTA or other stock classes. 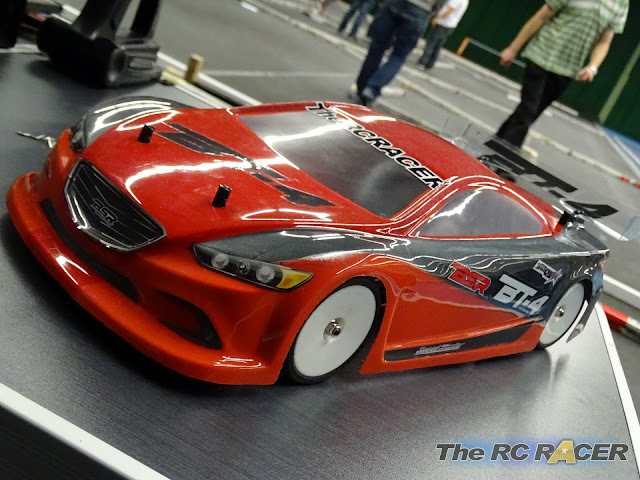 It is solid, fun to drive and competitive. This could be a popular chassis. 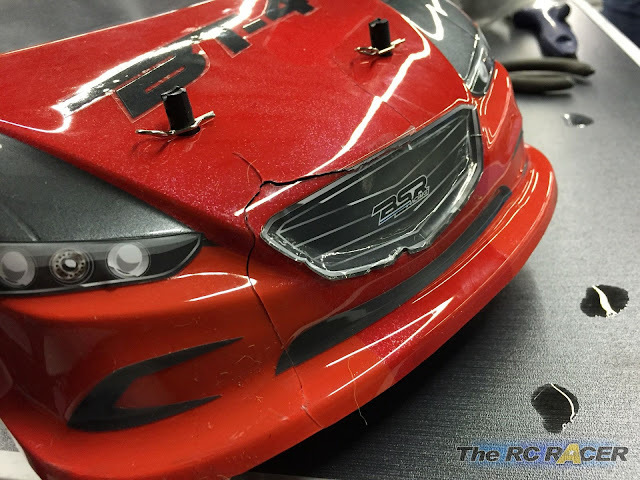 Update : Click here to see how the car has performed over a race series. 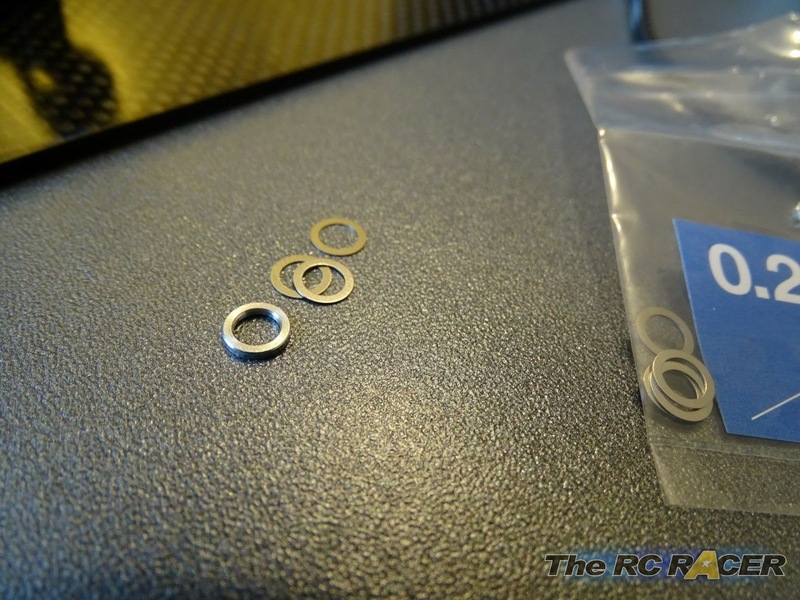 Have you found any replacement diffs/diff gaskets that will work? I ask because when I assembled the gear diff on mine, the screws cracked the pulley, and the paper gasket was torn when I disassembled it to find out why it was leaking fluid everywhere. 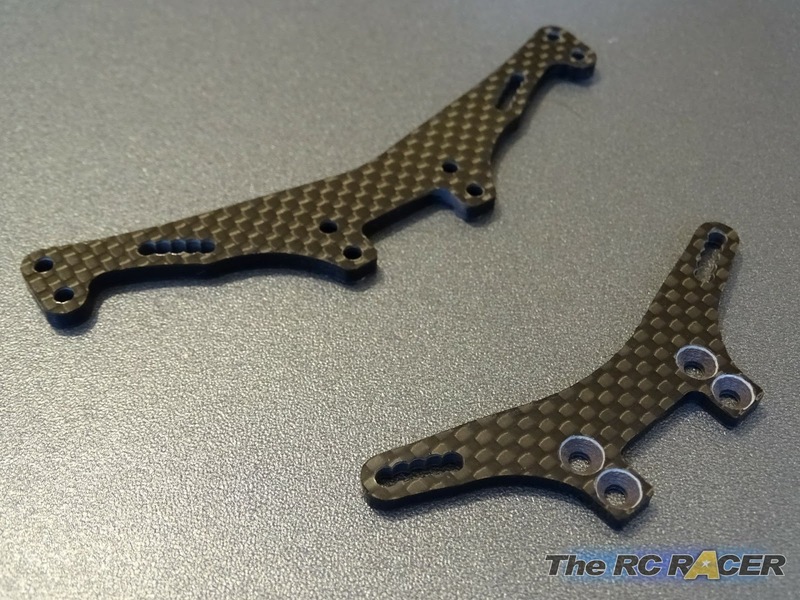 I cannot find a replacement gasket on Hobbyking's site that will fit, and I've tried a couple of different 3Racing diffs and gaskets with no success. Hobbyking told me I was SOL when I put in a customer service ticket about the diff. Hi, I was hoping you could explain how to change the height ride on this car? The shocks seem to be of a fixed lenght, and apart from moving the upper shock mount point, I do not see any other way? 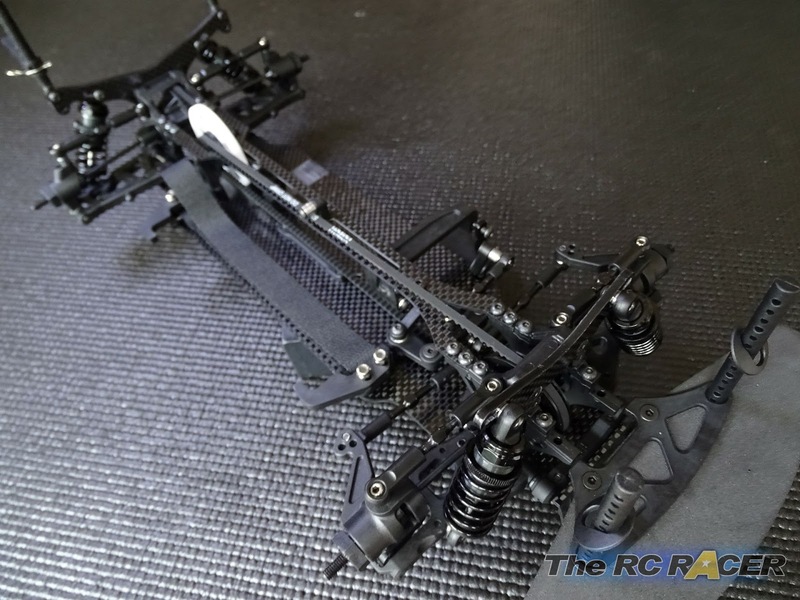 You adjust the ride height by twisting the spring adjusters on the shocks. 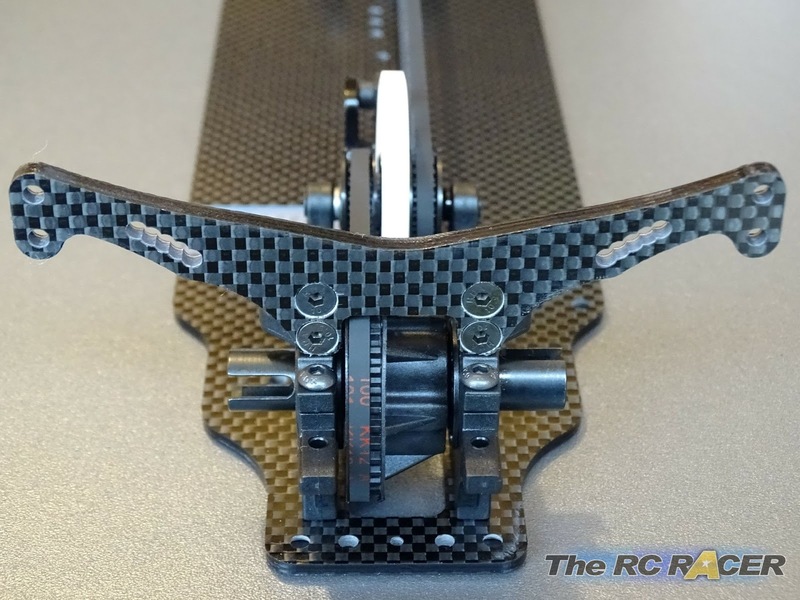 This can change the ride height a few mm. 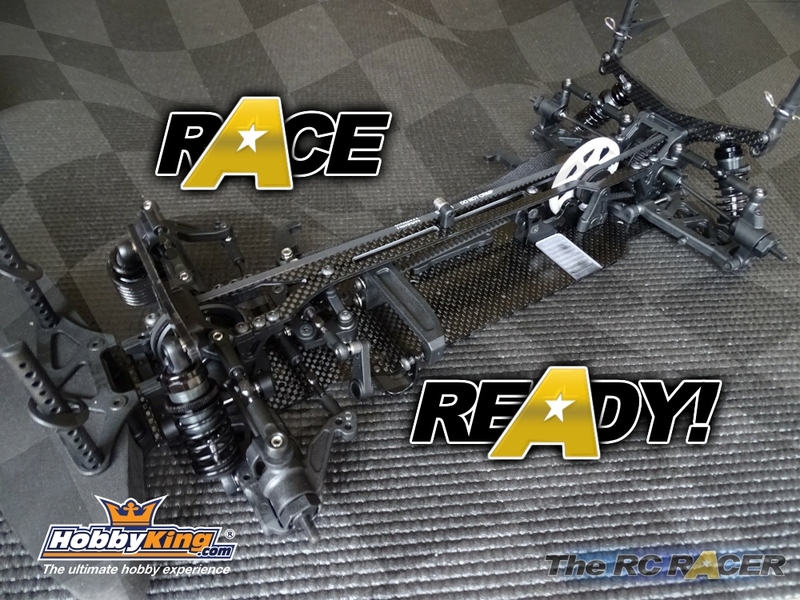 My local club now races these as a one model class and has told me to use this as a guide. 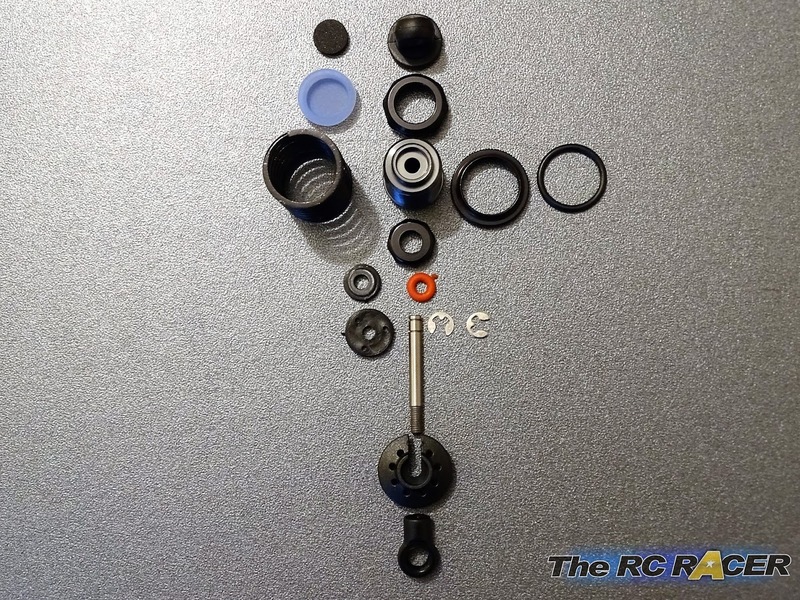 Do you use any of the alloy parts? They say that they are not needed, is this true? Personally, we have had a similiar experience as the poster of the article: the body shell is not so great :) It didnt last long before the front skirt caught onto something and broke... Even with the suspension raised. On the other hand, the other internal components seem to be pretty rock sturdy. 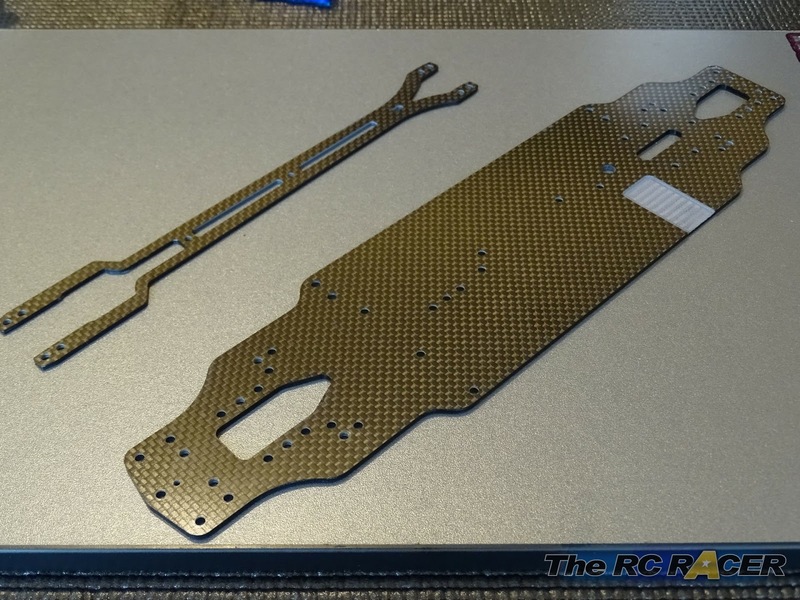 They say the base plate and struts are carbon fiber, although I think its a carbon fiber sandwich. The other elements, have a touch and feel of metal, but it seems to be some heavy duty plastic, I was really impressed. Can I ask where you got the shims for the spur from please? I cannot seem to find any that are the right size. The Article does not mention that this is a Relabled TeamC TR10, so all the Parts from the TR10 and TC10 fit. Which also means that for most suspension parts from Xrays, CSOs, WRXs and many others fit to. I was thinking about buying one of these cars. 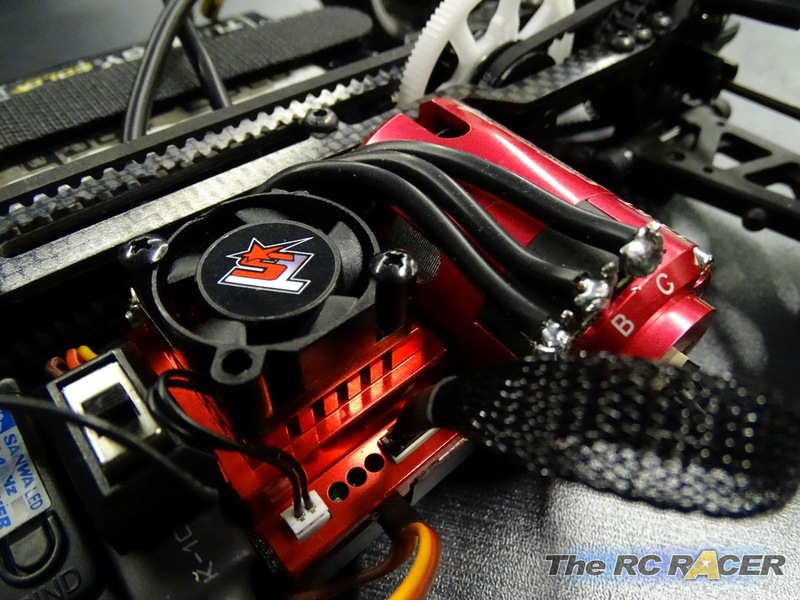 I was wondering how hard it is to find parts for and where to get parts for it. I just picked one up for $35 new on eBay. Shipped.